A local Yorkshire business man and his wife visited our recently refurbished showroom to view samples from our Silestone , Compac and CRL range of quartz ranges for their new solid surface kitchen granite worktops in their new extension. We gave them a free no obligation quote , which they went away to discuss and decide their options , they found our price unbeatable and quality unsurpassed from our time served stone masons and we agreed a template date with our now customary 5 day turnaround . 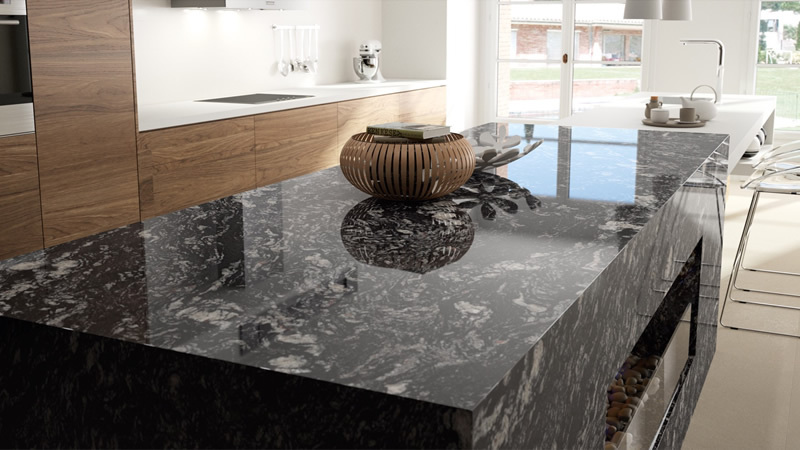 The material they chose was the 30mm Plomo quartz worktop from our Compac range for their kitchen worktops . Once the templates had been returned to our West Yorkshire family run factory our time served stone masons got on with the manufacturing process of the edge profiling , sink cut outs and drainer grooves , once completed within the 5 day turnaround our fitting team returned to install the quartz worktops , on completion the customer signed our installation satisfaction notes , happy days all round .We are now waiting for his testimonial and pictures to be uploaded to the web site , he has since returned to order a matching dinning table in the 30mm Plomo quartz worktop .